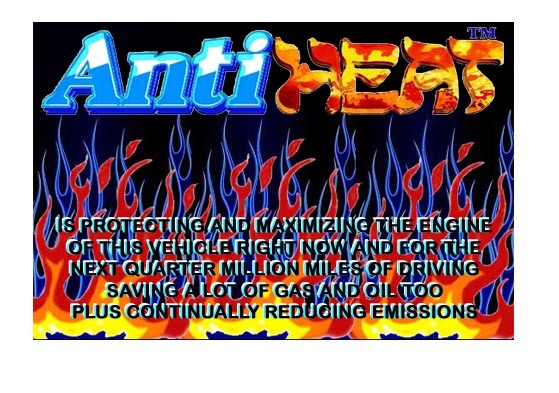 Anti-Heat is an all natural automotive product that has been well tried and testing in all types of vehicle and in all types of weather conditions including extreme heat and cold. The difference it will make to your vehicle is quite incredible with one Taxi cab company test showing savings on gas of over $3,200.00 in one year of using Anti-Heat in the radiator. THE BENEFITS TO YOUR ENGINE ARE ONGOING AND VERY NOTICEABLE, PLUS THE PRODUCT PAYS FOR ITSELF IN A VERY SHORT TIME PERIOD. THE PRODUCT FOR ALL VEHICLES, TRUCKS TRACTORS AND EQUIPMENT. 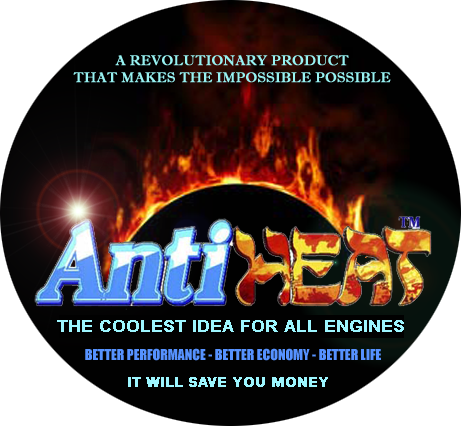 ANTI-HEAT™ Engine Maximizer is a uniquely revolutionary cooling system additive. It is designated for extremely hot climates or Summers, especially in slow-moving traffic, and long periods of engine idle, or for engines that work for long hours, such as taxi cabs, farm machinery, police cars, ambulances, public transportation, travel buses, shipping trucks and service fleets. Unlike the highly toxic and environmentally devastating Anti-Freeze that does not cool, this is a very safe and effectively cooling product. ANTI-HEAT™ formula is a plant-extracts-based, organic, absolutely non-toxic, completely bio-degradable, non-corrosive, environmentally useful, and without any bad effect on automotives, road or soil. It is less slippery than water if spilled, drying faster than water and helps clean up spilled oil and other junk. It dissolves deposits and cleans clogged-up radiators. 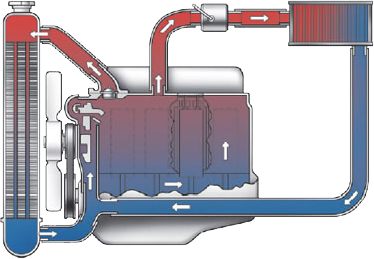 WHY IS THERE THE NEED TO REDUCE & CONTROL ENGINE'S HEAT? 1. Heat causes valve springs, wrist pins, cylinder walls, pistons and piston rings and other moving parts to expand, all at the same time and against the opposing directions of each others expansion. This results in hard friction, which causes immense wear and tear. Engines begin to stall, loose power, leak escaping oil and the ability of pistons to combust fuel diminishes, leading to unburned fuel passing into the exhaust system, causing backfires and failure of engine to start. Ultimately, this causes scratches and twists and engine freeze or melt its rings or pistons. Rebuilding such engine or replacing it, usually cost big money. 2. Heat causes gaskets to become dislodged because of the rapid high heating and then sudden cooling down. This causes oil to pass into cooling water, and water passing into oil chambers or typical head-gasket problems; thus, aborting proper operation, or even preventing the engine from starting. To remedy this, engines have to be rebuilt, completely changed if cracked, or head-gaskets replaced with all the necessary adjustments, expenses and down-time. This cost individuals and ultimately the country a great deal of desperately needed hard currency. 3. High heat always causes poor performance, inefficiency, chronic overheating and high consumption of fuel, as well as smoke, exhaust and oil pollution. 4. Over the long haul, heat severely shortens the life of engines and the under hood components, which means additional dead cars, tractors and trucks, as well as wasteful importation of spare parts. The ANTI-HEAT™ formula is added to the radiator only once, for up to 250,000 miles or until the radiator is flushed out. At such point, the formula is added at the same ratios suggested below. For trains, heavy construction equipments, ships, tanks, and armored vehicles, add one quart to every 8 quarts of water/antifreeze. In all-year hot climates, there is NO need to use anti-freeze because it has NO cooling effect, as it is designed for cold climates to prevent freezing. Within less than one month, savings in fuel alone will exceed the cost of the ANTI-HEAT™ formula. This is not to mention the extension of vehicle's life, improved performance and far lesser environmental pollution. Construction contractors, Landscaping and gardening companies, fire engines, ambulatory services, as well as farmers indicate that using ANTI-HEAT™ has alleviated heat from the engines of their equipment and water pumps. 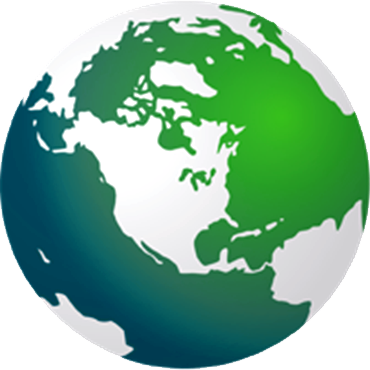 This has reduced or eliminated the "downtime" of machines and the added expenses associated with that. 1. A waste disposal transport company whose tractor-trucks make an average of 450 miles per day, saved 5.18 gallons per day on each vehicle which shows that they have averaged a saving of 1.15 Gallons per each 100 miles. They indicated in their report that they expect an average saving of 103.6 Gallons per day on their 20 tractors fleet. This means a saving of 37,814 Gallons per year of diesel fuel. 2. A Texas-based mobile air conditioning manufacturing specialists, reported that a Chevrolet 350, 4X4 Z71 pick-up was tested for the effect of the ANTI-HEAT™ formula on the engine and the Air Conditioning duct. "The vehicle was driven for approximately fifteen minutes and left to heat soak at idle for an additional fifteen minutes." There was a dramatic drop of 17degrees in the engine temperature, and 15 degrees in the A/C duct, after adding the formula.